Nothing is better than hands-on learning. This is a great opportunity for you to get top-notch training close to home. 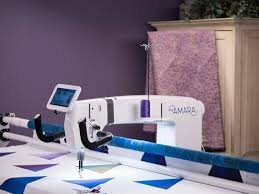 Handi Quilter is bringing a truck full of longarm machines to Walla Walla Sew & Vac to give you the best experience. Regardless of your experience or type of machine that you own, you will gain a lot from this event. Don't own a long arm machine? This is the best opportunity to try before you buy.